A teenager has been charged with arson after an attack which destroyed a £200,000 city centre statue. The 16-year-old was arrested with two other youths, aged 13 and 14, following the attack on the 'Forward' statue in Birmingham's Centenary Square on Thursday afternoon. West Midlands Police received more than 50 calls about the fire within minutes of it starting and arrived at the scene just after 1330 BST. 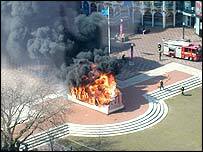 Police said the three youths, who are from the Bartley Green area of the city, were arrested in Victoria Square on suspicion of setting fire to the sculpture. A 16-year-old youth will appear at Birmingham Youth Court on 24 April. 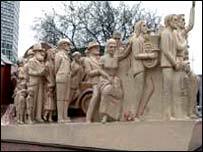 The £200,000 fibre-glass statue, by artist Raymond Mason, was erected when the square was completed in 1991. Claire Jepson Homer, who works at the nearby Birmingham Rep Theatre, told BBC Radio WM it was a shock to see the statue on fire. "The statue suddenly turned into a big cloud of smoke," she said. "It was quite a sight really." Forward, a cream-coloured work known locally as the Lurpak sculpture because it looks almost as if it is carved out of butter, was supposed to represent the city's early 1990s renaissance.